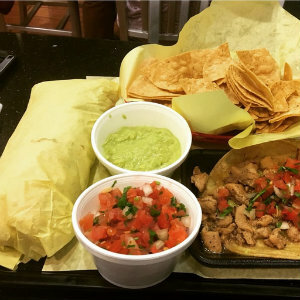 I'm always on the lookout for a great burrito, and Cali Tacos has made my list! Their menu is concise and they stick to what they do best, burritos! Their specialty burritos are big enough to serve two and are intimidatingly large! The Angel Burrito is a popular menu item: surf and turf with your choice of carne asada, carnitas, adobada, shredded chicken, or pollo asada mixed with large shrimps, rice, sour cream, guacamole, french fries, cheese, and their special cali sauce double wrapped in fresh tortillas. Their monstrous burritos do not compromise quality for quantity and are as delicious as they are huge! They stuff their burritos full of plenty of meat and shrimp to guarantee you'll come back for more (if you can finish it). They also offer another popular option: Supreme chips or fries with your choice of tortilla chips or french fries covered in guacamole, cheese, sour cream, pico de gallo, and beans and your choice of meat. There's no way of leaving unsatisfied. They also offer breakfast burrito options and tacos for anyone unsure of whether they can finish a huge specialty burrito. They're definitely worth a try! 1639 W. Chapman Ave., in Orange. 714.912.4888.